01.07.2017 – Water is now produced with solar energy in an environmentally friendly way! So make showers now a little more fun. The hot water is now produced by solar energy in an environmentally friendly manner. Also in the winter part of the heating water. And if the sun does not seem to be a day, the energy gained before is accumulated in a memory and used when it is needed again. Great secondary effect with this new system, that the hot water can be filled directly from the tap into the cup and consumed. Since the hot water runs through a plate heat exchanger, it is fresh water and not stale boiler water. 16.04.2017 – The all new Swimmingpool will be available very soon! The pool is disinfected by salt electrolysis as an alternative to the pool chlorine. The electrolysis process is achieved by the passage of the salt water solution through an electrolytic cell, which converts the sodium chloride (salt) into the water in Chlorgas. This, in turn, becomes sodium hypochlorite (liquid chlorine) as soon as it comes into contact with water. Despite the extremely low chlorine level, the pool can be effectively disinfected. In addition, the low level is particularly skin-friendly and can also be used in neurodermatitis. 27.02.2017 – Studio ‘ le petit’ bookable now! 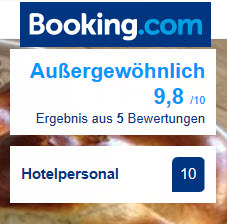 The Booking.com 2016 Guest Review Award! Thank you dear Guests fot that great Result in 2016. The Target for 2017 is to come closer to 10.